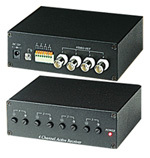 Eliminate interference under long range cabling caused by "impedance Matching" add TVB001 BALUN at "connecting point" between two-wire connections for compensation. Perfect to eliminate Hi Frequency Interference. - Vedio & Audio over one Coax Cable. Wide bandwidth, video gain compensation amplification. Ground Loop Interference with CCTV signals and can easlily install in a new or added to existing system. Smart twisted pair transmission products are designed for CCTV signal transmission over unshielded twisted pair wire (CAT 5 network cable). The most accurate, specialized and efficient tool for your scheduling, design, installation, test and adjustment of CCTV construction. Material: Aluminum, Glass - Advantages: Easy installation and maintenance. An ideal product for alering people.